My good friend Thomas Drugg sent me this image from the library in Östersund a few moments ago. RETROFUTURE 7 is available to pick up as of today. Will announce more later tonight. – “Started my new job yesterday as Visiting Professor of Music at Coventry University. Good start, I am looking forward to working with the students on their music”. Now, that is very, very cool! RETROFUTURE 7 arrived today, so that is a good thing. Took a few snapshots when the bus driver unloaded the boxes. Good days ahead. 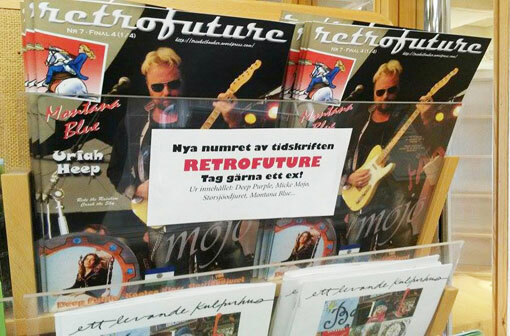 Got word from the printers today that RETROFUTURE 7 is on the way, so I should have the magazines on wednesday. Looking forward to the next few weeks then, and the inevitable feedback. Bought Total Film (issue 219) with Angelina Jolie as Maleficent on the cover, always a good read. Really want to see this movie. Also, the new issue (3 2014) of Sweden´s own Soldat & Teknik arrived in the mail today, and I really like this magazine. That is a Swedish S90 on the cover, the army has 509 of them and another 600 has been sold to five other countries. Lovely thing. On another note, looks like summer has finally arrived. After the last post I might as well owe up to the fact that I have a real soft spot for Vampirella. 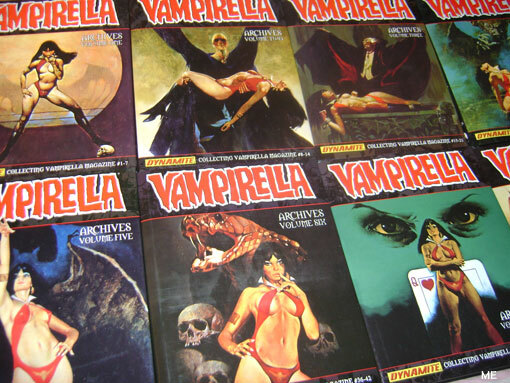 Dynamite started to publish the classic stuff in their “Vampirella Archives” series in 2010 and this is still ongoing. I have bought the first eight sets so far. These books are massive. When will we see Vampirella at the cinemas, I wonder? Got the first two copies of RETROFUTURE 7 in the mail from the printers yesterday and I am very happy about it. 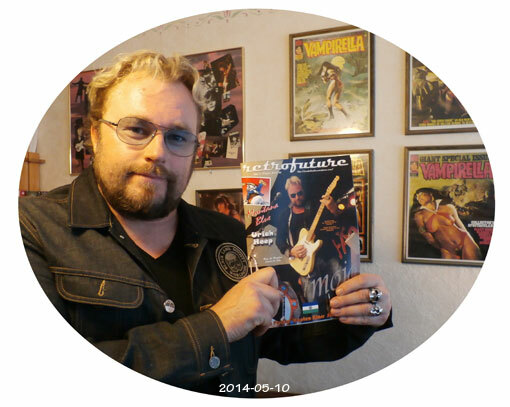 Tonight, cover boy (guitarist/singer) Michael Mojo Nilsson came by and picked up a copy. Took a few snapshots in my living room (yes, that is Vampirella on my wall!). 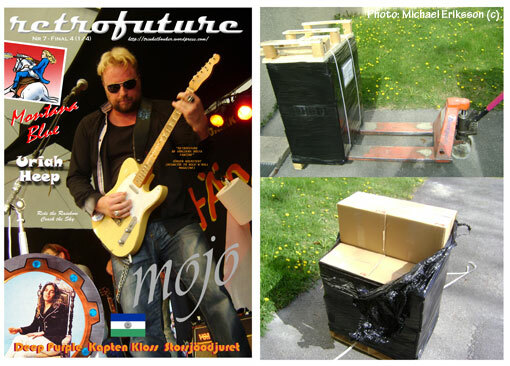 The Mojo interview is featured on this blog as an exclusive preview (see Classic Rock Interviews). Due out next week, The Summit´s “Higher Ground” (Monty Music) will surprise a lot of people. It is a staggering album, not a bad second on it. 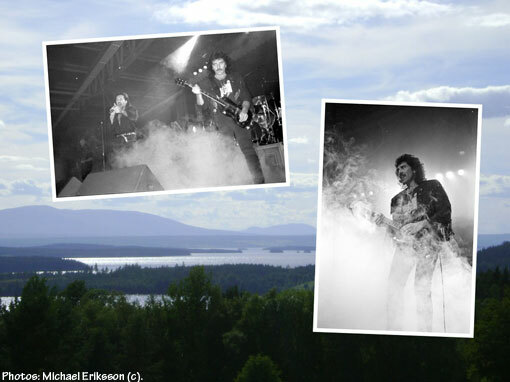 The Summit then, is four friends originating from Östersund (Jämtland county, Sweden) – all quite busy with their own careers – that wanted to have a quick blast together just for the hell of it. The resulting album might be the best thing any of them is likely to be on for some time. This really ought to be a full time band and not a project. 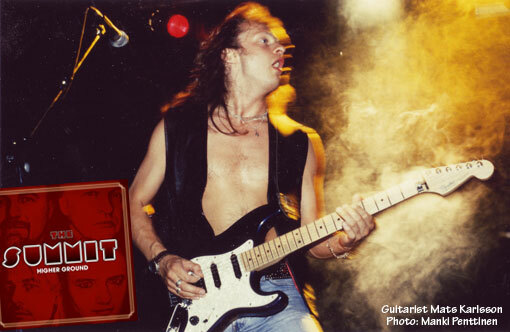 Guitarist Mats Karlsson (220 Volt) is a huge talent and his stamp is all over this record. He plays like a demon on this album and musically this really represents his entire life in music (except for the pure Metal of 220 Volt´s “Mind Over Muscle” period). The early influences of Deep Purple (that the entire band shares) is evident in “W.O.W” (short for “Walking On Water”) but the canvas is huge. Great riffs, melodies to kill for. It is a happy album, but there are a couple of epic tracks that sends me to heaven, “The Calling” and “Not My Country”. The latter could, in my opinion, be a massive hit in Classic Rock circles. 10 tracks in all, the album takes you back to the days of real music, played and performed by real musicians and artists. Drummer Björn Höglund (Hoven Droven) and bass player Lars Ericsson are a superb team (both were present on last years “The Abduction Of Big Papa Mojo” album with Michael Mojo Nilsson). Höglund has been the driving force behind this project and deserves a medal for his work. Singer Michael Klemmé is doing his first high profile work in the Classic Rock field (that I know of) here and it is about time that he is heard. I am so proud of these guys. This will be THE Classic Rock album of 2014. It deserves a follow up.